Our locking ceiling enclosures and antenna products preserve the integrity and safety of the ceiling system and airhandling space by effectively moving the wireless equipment into a conveniently accessed ceiling location. The ceiling enclosures generally look like a standard 2' x 2' ceiling tile, aesthetically concealing the wireless equipment. The products improve wireless infrastructure physical security by allowing the wireless equipment to be "locked down" in otherwise open office spaces. Wireless coverage is improved using the ceiling-mounted enclosures as the enclosure door provides an effective back-plane for the antenna, thereby optimizing the antenna pattern for in-room coverage. Moves, adds, and changes are facilitated by permitting easy access by authorized personnel. When you use Oberon's ceiling enclosures, once the enclosure is installed, you'll eliminate the need to lift ceiling tiles in search of above ceiling mounted wireless equipment. Oberon's wireless product line includes locking enclosures for virtually any building construction, indoor and outdoor. This includes wall-mounted locking enclosures and cut-away ceiling enclosures for hard lid areas, and NEMA 4 enclosures for outdoor environments. The products are constructed of steel and aluminum and are electrostatically powder coated for an attractive, extremely durable finish. Oberon's zone and telecommunications enclosures offer flexibility by securing networking and A/V components in the workspace where they are needed. Mounting access switches in the workspace brings bandwidth closer to the user, and reduces congestion in the telecom room. Oberon's specialty is wireless and telecom enclosure and mounting solutions, and the products are designed and tested by an experienced technical staff with extensive wireless networking survey, design, and installation experience. 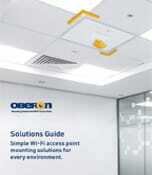 Oberon's products have been tested with most of the industry-leading wireless networking vendor products. As a product and design service vendor, we provide outstanding support to our market channel partners - the distributors, network designers, installers, and integrators responsible for enterprise wireless LAN installation. Our combination of patent-pending, innovative products, and industry-experienced staff will provide the wireless infrastructure designer exceptional cost, performance, security, aesthetic, and installation value.